Chaitra Navratri 2019 begins from April 6 (Saturday). One of the most important rituals performed during Chaitra Navratri, also known as Vasant Navaratri is Ghatasthapana Puja on the first day (pratipada) of Navratri as it marks the beginning of the nine-day festival. Devotees perform Ghatasthapana also known as Kalash Sthapana to invocate Goddess Durg. It is very important to do Ghatasthapana Vidhi (puja ceremony rituals and procedure) on shubh muhurat (auspicious timing) with correct Kalash Sthapana samagri (puja items) as failing to do so can invite the wrath of Navadurga (nine forms of Maa Durga). April 6th 2019 also marks the beginning of Hindu New Year in several parts of the country under different names, such as Gudi Padwa in Maharashtra and Ugadi in Andhra Pradesh, Karnataka and Telangana. Devotees will pray for Durga, the embodiment of divine motherhood, feminine power and creative energy to shower them with all her heavenly blessings. Chaitra Navratri 2019 Full Dates & Hindu Calendar: Ghatasthapana Puja Shubh Muhurat Time & Significance of Nine-Day Navaratri Festival. What is Ghatasthapana or Kalash Sthapana? The word “Ghatasthapana” is a combination of two words - “ghat” meaning “earthen pot” and “sthapana” meaning “establish.” It is carried out with utmost sincerity and dedication according to the shubh muhurat and Hindu scriptures. Ghatasthapana is the invocation of Goddess Durga (also known as Maa Shakti and Maa Parvati) to bless her devotee and ensure their well-being. Ghata or the sacred pot is the main object of worship during Navratri in which devotees invoke Goddess Shakti for worship for the nine-day festival. 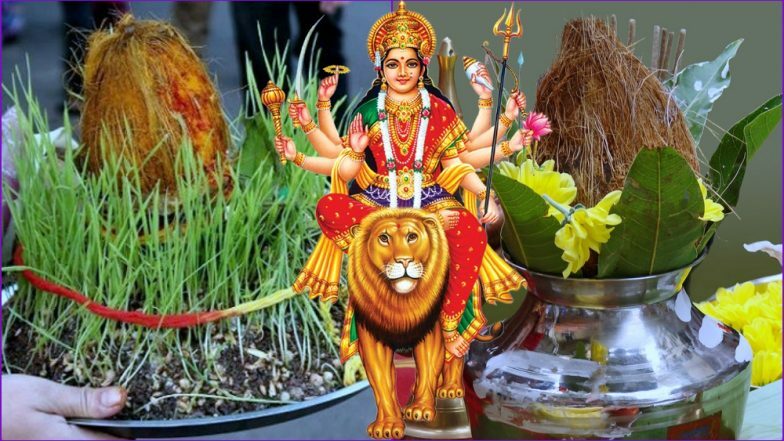 According to Drik Panchang, Chaitra Navratri 2019 Ghatasthapana Puja shubh muhurat is 05:39 to 09:47 on April 6, 2019 (Saturday). Devotees will have a window of four hours and seven minutes to perform Ghatasthapana Puja. It is to be noted that Ghatasthapana Puja is to be not performed during Amavasya and night time. It is strictly prohibited. Navaratri 2019: What’s the Difference Between Chaitra Navratri and Sharad Navratri? The most auspicious time to do Ghatasthapana is first one-third of the day while Pratipada is prevailing. But for some reason, if a person is unable to do so, they can do it in Abhijit Muhurta, an auspicious time during midday which approximately lasts for 48 minutes. Abhijit Muhurat time on April 6th is from 11:26 to 12:15. Chaitra Navaratri 2019: The Benefits of Fasting; Why Observing Vrat or Upvas is Good for Health. The items you will need to do Ghatasthapana is -- a wide clay or metal pot, clean soil, Sapta Dhanya or seven different grains, small clay or brass pitcher, holy water or Ganga Jal, marigold and other flowers, garland, durva grass, moli/kalaya or sacred coloured thread, perfume, supari (betel nuts), coins, a five-leaved branch of Mango or Ashoka tree, unpeeled coconut, rice as Akshat and red cloth to wrap coconut. Step 1 – Begin With Kalash Preparation: Take the wide clay pot and sow the grains (Sapta Dhanya). One needs to do this by sowing grains in three layers of soil. Now take the small brass pitcher or Kalash, tie the sacred thread (moli) on its neck. Fill it with holy water or Ganga Jal, put supari, coins, perfume, akshat and durva grass. Put the mango or Ashoka leaves and place the coconut (after wrapping it with the red cloth and moli). Now take this Kalash and place it in the centre of the wide clay pot with soil and seed. Step 2 – Invocation of Goddess Durga: Pray to the almighty Goddess Durga to accept your invitation of gracing your household with her presence. Say Durga mantra and aarti to invocate Maa Shakti and her nine manifestations to reside in the Kalash for the period of the next nine days. Step 3 - Panchopachara Puja: Panchopachara Puja means worshipping Goddess Durga with five puja items after she has been invocated. For Panchopachara Puja, you will have to light a diya, show it to all the deities, burn incense sticks and again show it to the Kalash. Offer flowers to the Goddess residing in the Kalash, offer scent. At the end offer Naivedhya comprising fruits, sweets and other prasad. One must also sing Durga aarti and Navratri bhajans and mantras to please Durga. After successfully doing Ghatasthapana Puja, you should worship the first form of Maa Durga – Devi Shailputri. She is worshipped on the first day of Navratri. For Shailputri Puja, offer the goddess red cloth as she associates with the crimson colour. You must offer her jasmine flowers. Chant Shailputri Puja mantra, Navratri aarti and mantras to complete the puja on the first day. Chaitra Navratri is the second most significant of four Navratri that falls in a year. Despite Ghatasthapana and Sandhi Puja being popular during Sharad Navratri (September-October), the two are also carried out during Chaitra Navratri and with utmost dedication. After praying Maa Shailputri on the first day, we will be praying Goddess Shailaputri, Goddess Brahmacharini, Goddess Chandraghanta, Goddess Kushmanda, Goddess Skandamata, Goddess Katyayani, Goddess Kaalratri, Goddess Mahagauri and Goddess Siddhidhatri over next days till April 14.